In a display widely reported as “arrogant” and “contemptuous” (and which can be viewed in full here), the 75-year-old Swiss, the head of Fifa since 1998, declined point blank to answer a number of significant questions. He provided fudged, unimpressive responses to others. On Wednesday, as things stand, he will be re-elected unopposed as Fifa’s president, following the withdrawal of his only rival candidate, Mohamed Bin Hammam of Qatar. Sportingintelligence was told late on Saturday afternoon that Bin Hammam was about to pull out of the presidential race, with one source saying he was doing so under pressure from the Qatari Royal family. The withdrawal statement was ready, the source said. We called and texted Bin Hamman but received no reply. In the early hours of Sunday, UK time, a withdrawal statement was made public. Another source said a deal had been struck whereby Bin Hammam would leave the way clear for Blatter to be re-elected unopposed if Blatter, in turn, made sure that the decision to send the 2022 World Cup to Qatar would not be overturned or reassessed. Bin Hammam has not responded to calls. Blatter – cleared by Fifa’s Ethics Committee himself of any recent wrongdoing – won’t answer questions. It has been reported, by Dagbladet in Norway, that Blatter made an impromptu visit to a gathering of Fifa Ethics Committee members earlier this year in Zurich to praise their work and to let them know they would be re-elected unopposed for another four years in their posts. They’d met to discuss allegations about Jack Warner and ticket touting at the 2010 World Cup. Blatter’s re-election will happen against a backdrop of disapproval and calls for his removal from office, from fans, activists and politicians. Blatter has been apparently close to the end of his Fifa career amid accusations of corruption before, more of which later. But before detailing some of Fifa’s political history and scandals for those who might not know or recall some of the relationships and histories involved, here is a brief recap of the past week’s events and accusations. Wed 25 May: Fifa announced Bin Hammam and Jack Warner had been charged with offering bribes to Caribbean members of Fifa’s 208-man electorate in exchange for supporting Bin Hammam in the presidential election. These allegations came via Chuck Blazer, who has worked closely with Warner in Concacaf for years. Paul Kelso’s detailed report in the Telegraph about the contents of Blazer’s dossier of bribery allegations is linked here. Kelso is on Twitter @pkelso. A photo of an actual cash bung from the alleged scam, next to an actual brown envelope, can be found at this Twitpic link courtesy of Martyn Ziegler (@martynziegler) of the PA. Sat 28 May: Warner warns of a ‘football tsunami’ ahead of the presidential election. Blatter gave $1m to Concacaf in May ‘to spend as it deems fit’, an act that annoyed Uefa president Michel Platini, who approached Fifa secretary general Jerome Valcke – a key Blatter appointee and ally – to complain, only to be told Valcke would ‘find the money for Mr Blatter’. Valcke said Qatar ‘bought’ the World Cup. (Valcke later confirmed the email in which he wrote this was genuine, but that he meant Qatar had ‘bought’ the World Cup – with financial muscle generally – rather than ‘bought’ the World Cup – with pure old fashioned bungs). The case against him and Bin Hammam is politically motivated and not subject to due process. Blazer can’t be trusted (citing evidence from an unrelated court case where a judge said Blazer couldn’t be trusted). Mon 30 May: Blatter held his now notorious press conference. By Tuesday 31 May, Warner is saying ‘support Blatter’ – which a cynic might interpret as Warner having been told to hold any further tsunami revelations in exchange for guarantees that he’ll by alright, Jack. Now to recap some of the key accusations against senior Fifa figures over the past 13 years, beginning with Blatter himself. The following is intended as a summary, with links for detailed further reading. The longer-term relevance of Havelange’s support for Blatter – and Teixeira’s – is that both Havelange and Teixeira have been implicated in taking massive bribes from ISL as part of $100m in bungs to football officials. The central point of the BBC Panorama programme that caused such a brouhaha on the eve of the 2018-2022 World Cup votes in December was to expose a secret internal ISL document that detailed 175 bungs. More can be read on this in a blog by Panorama editor Tom Giles, while the show itself can be seen at this link (not available to viewers in all regions). More recently, in the latest Panorama about Fifa, broadcast on 16 May 2011, it was specifically alleged that Havelange took a $1m bung in 1997 that Sepp Blatter knew (and knows) about. A criminal investigation in Zug, Switzerland, has come to this conclusion, but Fifa is blocking the release of those findings. The May 2011 Panorama can be seen here. Thus the headline corruption accusation against Blatter himself is he came to power through corrupt patronage, supported by people he knows have taken and given bribes, but has chosen to cover this up and keep it quiet. Teixeira, subject to a number of corruption allegations in his native Brazil, remains on Fifa’s ExCo and is in charge of running the 2014 World Cup in Brazil. In May 2002, with the Fifa presidential election looming – between incumbent Sepp Blatter and challenger Issa Hayatou – Blatter was the subject of a formal legal complaint by 11 Fifa colleagues, comprising five Fifa vice-presidents and six other ExCo colleagues. Blatter’s response to the accusations, shortly after they were made, was to suspend an internal Fifa investigation into the matter on the grounds that confidentiality was being breached. “In order to guarantee and to protect the interests of Fifa and the Fifa executive committee, I have to suspend the work of the Fifa ad hoc Internal Audit Committee,” he said at the time. He duly stood against Hayatou and won easily, amid yet more suggestions of rigging and cronyism. After the prosecutor dropped the charges, it was announced that Concacaf (domain of Warner and Blazer) would get an extra play-off place for the 2006 World Cup at the expense of Europe. 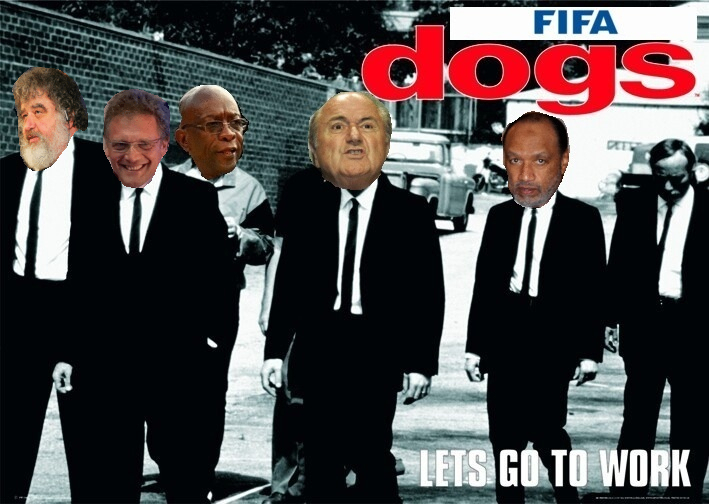 Michel Zen-Ruffinen had already been sacked, and was replaced by Urs Linsi, a Blatter ally. Warner has been accused of a catalogue of malpractice, from not paying Trinidad & Tobago player bonuses at the 2006 World Cup, to asking for cash for a friendly international to be paid into his own account, to snaffling lucrative Fifa contracts (for staging tournaments and / TV rights) for a pittance, to the most recent allegations of being party to bribes. Time and again he has escaped charge, let alone punishment – because of the protection of Blatter, to whom he has been a staunch ally, delivering bloc votes from Concacaf in the past. But even Fifa itself has found him guilty of one offence: wide-scale ticket touting. This was exposed most comprehensively on Warner’s own turf in late 2005 and early 2006 by an investigative journalist, Lasana Liburd. (Link here). Working with Liburd, The Independent (for whom I was then writing) established, contrary to Warner denials, that his family-run Simpaul travel business was still touting 2006 World Cup tickets. This coverage prompted Warner to ask Fifa’s Ethics Committee to consider his conduct. He expected to be cleared by his cronies. Instead, in secret, they found him guilty of unethical behaviour. Mohamed Bin Hammam was among the members of the Ethics Committee at the time who used the word ‘unethical’ to describe Warner’s touting, as sportingintelligence reported in December last year when we published a secret memo from the 2006 Ethics hearing. Dagbladet in Norway subsequently reported Warner was touting again at the 2010 World Cup. Report linked here. As far back as the 1998 World Cup in France, there were strong suspicions that World Cup tickets assigned to senior officials and confederations were being sold for big profits on the black market. It was considered a routine perk of football life. During an investigation for The Independent in late 1998, I was told by a source that Concacaf officials were particularly culpable, including senior figures. 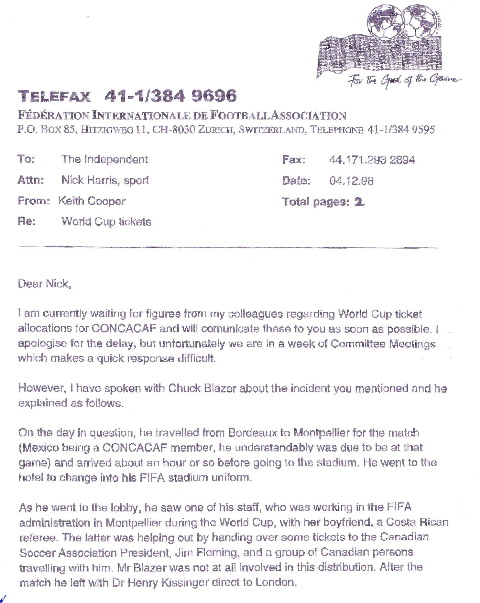 I had an eye-witness account from somebody who had been in a hotel lobby in Montpellier and said that Chuck Blazer was present as a batch of tickets changed hands at above face value, passed between people in the Concacaf party – including a female Blazer employee and her boyfriend, a Costa Rican referee – and some fans. This was, potentially, a sensational story: Blazer, who had been a Fifa ExCo member since 1996, party to the irregular distribution of World Cup tickets in a hotel lobby. I contacted Fifa and asked for an explanation. None came. I contacted Fifa again – it was late November 1998 by this point. 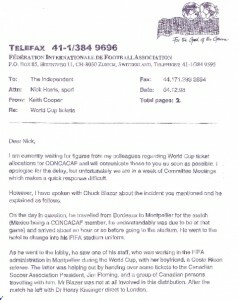 On 4 December 1998, I received a response by fax (left, click to enlarge) from Keith Cooper, who was then head of media at Fifa. (Cooper was axed, years later, in a Blatter purge). Blazer was not touting tickets himself, it seemed. A senior Fifa insider separately told me at the time that Blazer was ‘not very happy that the Costa Rican referee was involved in this’ and that ‘the system [of ticket distribution] is anyway far from perfect’. Newspapers will routinely have large amounts of information that they can’t or don’t publish for various reasons. On this occasion, we’d been told Concacaf tickets were touted in France, and Concacaf officials were involved, and that Blazer was present. But Chuck Blazer gave his explanation as to his own non-involvement, and with no big scalp, we didn’t run it. It would be interesting to know now what measures, if any, were put in place after that to make sure that Fifa official tickets, especially within Concacaf, didn’t get touted from within. Evidently not many measures were taken: Jack Warner took the touting in-house, and Fifa certainly knew this and privately censured him for it as long as five years ago. Only in the past few days has he apparently become expendable. Or not. MasterCard had been a Fifa sponsor for 16 years when they were dumped for Visa in a move that led to a high-profile court case in 2006. Chuck Blazer’s evidence was described by Judge Loretta A Preska as “generally without credibility based on his attitude and evasive answers on cross examination.” His testimony was rejected as fabricated. As detailed in this contemporary report, other Fifa employees were implicated in wrongdoing, including Jerome Valcke, then director of marketing and TV. “The employees who had conducted negotiations were accused of repeated dishonesty and giving false information to the Fifa deciding bodies in question,” said Blatter. They were fired for breaching business principles, although Blatter later said Valcke chose to leave. Valcke is now the general secretary of Fifa and on Sunday was prominent at the press conference announcing the suspension of Warner and Bin Hammam following those allegations made by Blazer. Warner and Bin Hammam both allege a set-up involving Blatter, Valcke and Blazer. Warner and Bin Hamman both say due process was ignored in the run-up to their suspensions, and certainly it seemed odd that Valcke should brandish apparently supporting evidence against the pair, received at the 11th hour, during a press conference. (This was a communication from Puerto Rico). Blatter maintains that it is ludicrous to suggest he would set up his sole presidential race rival for a fall. As stated previously, the above is a brief summary of historical events. Further reading is recommended on other more recent – and easily available – accusations that have been made / denied / disproved / ignored relating to current and recently former Fifa ExCo members Issa Hayatou (in relation to ISL and 2022), Warner, Angel Maria Villar Llona of Spain (in relation to the alleged collusion deal with Qatar over 2018-22), Teixeira (over ISL and by Lord Triesman), Bin Hammam, Worawi Makudi (implicated by Triesman and in relation to collusion deal with Qatar-Spain), Nicolas Leoz (ISL and implicated by Triesman and others around 2018 bidding), Jacques Anouma (implicated in alleged bungs as reported by the Sunday Times), Amos Adamu (ditto) and Reynald Temarii (ditto). NB: Other dodgy Fifa-related figures are available, including a wide range of middlemen and fixers, but we don’t have the time or will to include them all. 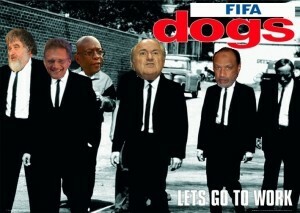 MOTTO: Fifa, overseen and ruled by Sepp Blatter – for the good of the game? On all matters Fifa, sportingintelligence would also recommend that you follow the brilliant Tariq Panja of Bloomberg (@tariqpanja), the immensely well connected James Corbett (@james_Corbett), the fearless Rob Harris of AP (he of the Fergie whispered ban threat, @RobHarrisUK) and Torgeir P. Krokfjord of Dagbladet (@tpk360), as well as Kelso and Ziegler, while the Guardian sports editor Ian Prior (@ianprior) routinely retweets the findings of his massed reporting troops.